Mary Jane Wilson was born February 10, 1823 in Charleston, New Hampshire. She moved with her staunch Presbyterian family to Reading, Ohio where they raised their children and farmed. At the age of 20, Mary Jane married Rev. George Washington Pyle, Sr., who was born Aug. 12, 1813 outside of Philadelphia, Pa. His father was a Quaker. He trained as a carriage maker and was working in N. Carolina when he was converted during a camp meeting and decided to become a minister, joining the Presbyterian faith. Barely literate, he struggled to learn at Jacksonville Seminary (Jacksonville, Illinois, later renamed as Illinois College) while supporting himself in his trade. His room in college was over that of the Seminary’s president, Rev. Edward Beecher, a brother of Harriet Beecher Stowe. Pyle graduated from Illinois College, B.A. 1840, and M.A. 1843. He also studied at Lane Seminary where he received his license to preach. He was a minister at a Presbyterian church in Reading, a city about eight miles from Cincinnati. While in Reading, Rev. 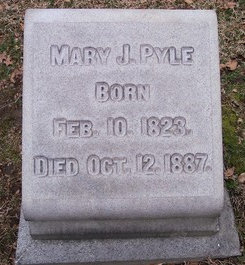 Pyle married Mary Jane Wilson, on Nov. 2, 1843 and in 1844 they moved to Monticello Female Institute in Godfey, illinois where he took up his post as Chaplin. He died there Jan. 22, 1846 after a short illness, leaving Mary Jane with their son Theodore (born Oct. 21, 1844 and probably named for Theodore Weld) and pregnant with their son George W. Pyle, Jr. Mary and her son returned to Reading. In 1849, The Wilson family moved to the more abolitionist-friendly College Hill where Mary Jane became a matron and Botany teachers at the Ohio Female College which was next door to the Wilson family home. Mary Pyle had married an abolitionist. When George W. Pyle, Sr. was a student at Illinois College, the 1837 riots at Alton, Illinois occurred, just a few miles from the college. Rev. Elijah P. Lovejoy was an abolitionist who published The Alton Observer, an anti-slavery newspaper, and who, like James Birney, had been chased from city to city by anti-abolitionists. A Presbyterian, his newspaper was also against Catholicism and pro-temperance. He was also a close friend of Rev. Edward Beecher. Unfortunately for Lovejoy, his printing press continued to be attacked, broken and thrown into the nearby river. As a response Lovejoy and Beecher called for a state anti-slavery convention to be held in Alton in Oct. 1837. George Pyle was a signer of the call for the convention. During the convention both pro and anti slavery supporters were present and spoke. The abolitionists were drowned out by the pro-slavery followers which had packed the meeting. The resolutions that finally passed were all proslavery and Lovejoy was asked to leave town and to cease publishing his paper. Shortly after the convention, a new printing press was delivered to Lovejoy, a riot ensued and Lovejoy was shot and killed. He died on the day before his thirty-fifth birthday, Nov. 7, 1837. A trial was held; no one was found to be responsible for his killing. Beecher wrote a book about the riot and the abolitionists had a martyr. Against this emotional background, Pyle surely would have hardened his resolve and deepened his commitment to anti-slavery work. After his marriage and their return to the Alton area to work and live, George and Mary Jane would have also been steeped in Lovejoy’s murder and its ramifications. For many years Mary was president of the Women’s Home Missionary Society. The College Hill Presbyterian church has a stained glass window in her memory donated by the Sunday school. She was also the president of the College Hill branch of the Woman’s Temperance Movement – in her lifetime, College Hill did not allowing the sale of alcoholic beverages. Mary Jane died of a heart attack on Oct. 12, 1887 She was in Piqua, Ohio where she was attending a Synod of Ohio meeting. Mary Pyle Wilson brought not only her anti-slavery experience living in the Alton, illinois area to her work inCollege Hill, but also her time at the Montecello Female Academy. 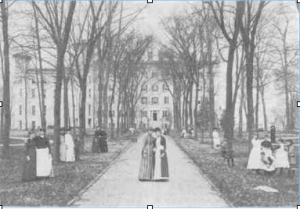 Upon returning to College Hill, she became the matron and botany professor at the Ohio Female College and positively effected generations of young women in her charge. Her students and friends published a memorial book with many tributes to her life and works.